The Challenges Ahead for Quito: "South America's Jewel"
In response to Egypt's disastrous 1992 earthquake, an international conference was convened in Cairo to help direct funding and technical support to the conservation needs of Egyptian monuments. 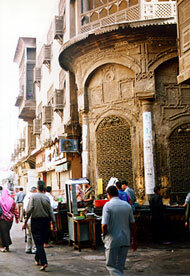 Cairo's historic quarter. Photo: Guillermo Aldana. The conference, which focused on restoration of Islamic monuments in Egypt, was held June 12-15, 1993 at the American University in Cairo. Organized by the American Research Center in Egypt (ARCE), the Getty Conservation Institute, and the Egyptian Antiquities Organization (EAO), the gathering was a response to the magnitude 5.9 earthquake that shook Cairo's Islamic quarter October 12, 1992. Experts in conservation and seismology met in Egypt's capital for technical discussions, and surveyed mosques and other historic structures in damaged areas throughout the old city. The conference's objective was to assemble a consortium of expertise to assist the local and foreign governments in earthquake response efforts. The Honorable Robert Pelletreau, United States Ambassador to Egypt, attended the conference to emphasize the need for an integrated approach to the damaged district. Since the conference, ARCE has completed negotiations with the U.S. Agency for International Development to administer a $15 million fund for the conservation of Egyptian monuments. The Director of the Getty Conservation Institute, Miguel Angel Corzo, expressed satisfaction with the conference and its aftermath. "In light of our own collaborative efforts with the Egyptian government, we were pleased to join with ARCE and the EAO in organizing the Cairo Conference," he said. "We are, of course, gratified to see that this recent exchange of ideas has helped stimulate additional support for conserving Egypt's cultural heritage." The conference was attended by over 200 participants who reviewed the earthquake recovery efforts undertaken by Egyptian and foreign teams, exchanged information about similar experiences elsewhere in the world, and developed recommendations for future work in Cairo's historic zone. Nineteenth century illustration of the Mosque of Ebn Touloun in Cairo. For centuries the Islamic quarter of the city has blended together the secular and the spiritual. Within the quarter can be found not only great stone mosques, but also a labyrinth of narrow streets lined with shops and cafes where so many of Cairo's denizens have made their fortunes and their pleasures. Today this staggering sprawl of sand-colored structures remains a place where commerce is performed and prayers said. But its dignity and glory are sorely faded, beset not only by seismic activity, but modern urban life. In the conference's opening ceremony, Mark Easton, ARCE's Cairo Director, told the assembled participants that the October 1992 earthquake "brought a new urgency" to the conservation of Islamic monuments. He called for foreign institutions to "enter into a renewed dialogue with the appropriate Egyptian officials, a dialogue which distinguishes between the desirable and the possible," then to work toward doing "the possible." During the three and a half day conference, technical papers were presented by experts in seismology, engineering, architecture, and conservation. Dr. Ahmed S. Ouf of the Department of Architecture in Cairo University's Faculty of Engineering proposed that restoration priorities be considered within a wider perspective than that of the urgency of the structural needs of each building. "Islamic monuments," he stated, "need to be restored according to their cultural value, their historic importance for their periods of construction, their possible current uses, as well as their location within the city." Dr. James Wight of the University of Michigan reported that while the earthquake resulted in some "cracking in walls, arches, and domes" of some Islamic monuments, "the damage caused by the earthquake seems to have only added to a long and ongoing process that predates the earthquake. The primary reason for such damage is high ground water." A number of other speakers also noted the destructive role of ground water, as well as other factors. Ms. Nairy Hampikian, an architect with the German Archaeological Institute, stated that "in the last fifty years, the rising water table, the serious lack of maintenance, the new transportation means in the old city, and other newly introduced factors all accelerated the deterioration of the monuments which now all need special care." Dr. Mohamed Abd El-Hady of the Department of Conservation in Cairo University's Faculty of Archaeology observed that the high porosity of the limestone used in many of Cairo's historic structures is responsible for the high levels of water found in these structures' walls. The Getty Conservation Institute will continue to participate in ARCE's efforts to support conservation work on monuments from all periods of Egyptian history. The court of the Ebn Touloun Mosque. Jane Slate Siena is Head, Institutional Relations of the Getty Conservation Institute, and Managing Editor of Conservation, the GCI Newsletter.